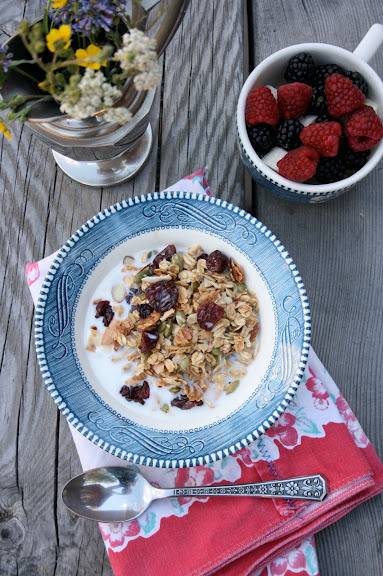 Looking for a killer granola recipe that’s super easy to make, yummy, and not loaded with added sugars? Well, look no further my friends. This one is not only full of delicious ingredients, but it’s healthy too. I’ve made several batches over the past 3-4 weeks and have enjoyed eating it on an almost daily basis. You can find the recipe over at the Zupas blog today. My family had those blue-&-white plates, bowls, etc. you showed. Funny how much more appealing the pattern looks now than it did in the 80s. Starr, these are the plates stocked at my MIL's family's cabin. I'm not sure how long they've been there...but 30 years sounds about right! I took this image up there this past weekend. I can indeed vouch for this as delicious granola-- since I had the pleasure of eating the very bowl pictured! mmm. thank you. am always on the lookout for the perfect granola. mmm. thank you. I love trying new granola. i can't wait.